Now you can specify the quantity you have available in stock or you can simply start tracking the quantity from zero. 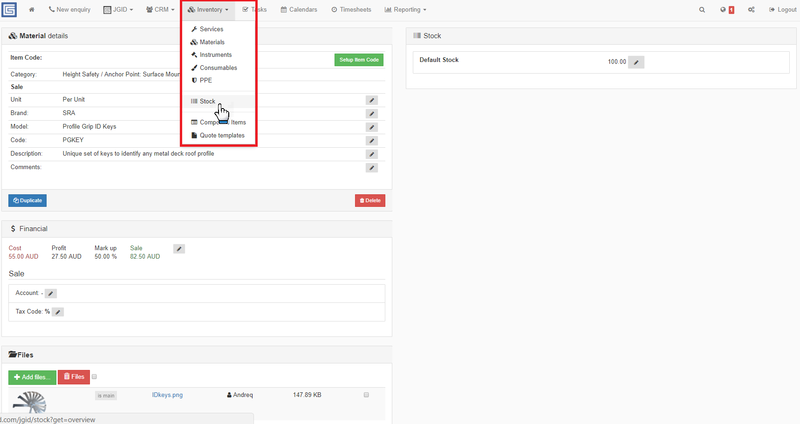 In the Stock category you can select the item category whose stock track list you would like to inspect. Select the relevant tab and inspect the contents under it! In this list you will find the item whose stock you are tracking and in addition you can also manually update the available quantity should changes need to be applied! Simply click on the item and edit the stock quantity as per your preferences. Important: Next time you place an order for this particular item, the system will automatically update the quantity in Stock. Respectively, once you generate a Daily Labour Summary (DLS) sheet and indicate in it that you have used a certain quantity of a given material, provided you have activated stock tracking for this material, JGID will also automatically subtract the right quantity from your stock supplies to ensure you have an up to date quantity summary of the stock in place!